Over the past couple of months I have had the privilege of digging deep into the purpose and vision of family ministry. I have looked at everything from the why to the how to the what. Why do we do what we do? How do we implement family ministry in way that brings honor and glory to God? What do we need to do differently in order for our families to truly experience God’s fullness. This mind-boggling conversation has caused me to fill up pages upon pages of notes. I have spent hours researching what other churches are doing while looking at what parachurch organizations are available for us to partner with. Our team has evaluated every aspect of what we have done and where we currently are. We have spent time actively seeking what God desires of us over the next weeks, months, and years. My conclusion is not profound. Instead, it is simple… Although families are full of brokenness, through the grace and truth of Jesus, we have the only message that can provide true healing and restoration. As much as we think we have our act together as parents, spouses, and children, the majority of us are broken, messed up individuals in need of repair. The message of Jesus is also incredibly simple – he has come to ‘seek and save that which is lost.’ In other words, he has come to restore the broken, heal the fractured, and transform the lost. I come into contact with brokenness amongst families on a daily basis. Whether it is a past mistake destroying a marriage, a lack of trust and compassion, or moments of crisis ruining a families’ rhythm, many families are faced with extremely difficult circumstances. As a church, we are called to share Christ’s love, grace, and mercy to those in need, including the family that lives across the street that may walk into our church doors for the very first time. The mission God has called us to is clear – empower and equip parents to be pastors! The church, as a whole, has a tendency to take too much responsibility for the spiritual growth of our children and students. 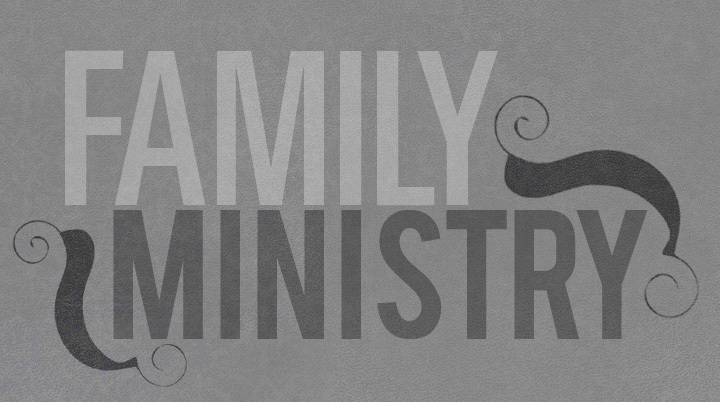 That is not family ministry. Instead, living out a Christ-centered family ministry means that we are providing our parents with the tools, resources, and relationships they need to live out their God-ordained calling as parents. They must become the spiritual leaders of their homes! We preach ‘what happens in our homes is more important than what happens in our church.’ While I believe that wholeheartedly and agree that it sounds wonderful, I often feel as if it is a simple statement that lacks integrity. In other words, God is challenging me as a Family Ministry Pastor to truly begin living that phrase out practically! The more I hear from God, the more he challenges me to truly practice what I preach – not only on a personal level, but also from a standpoint of leadership within ministry. I am excited to see the practicality of family ministry rise to the next level over the next few weeks, months, and years – a level that in which we will see families discipling other families while being discipled. It is a level that not only experiences numerical growth, but also passionately cares about the spiritual development of our children and students. Finally, a level in which parents truly become the pastors of their homes! As we lay out the vision for family ministry, my prayer is that we are not drawn one bit away from the vision God has for us. May we constantly walk in step with Him every day of our lives – seeking Him, listening to Him, and obeying Him at all cost! Through our obedience may families within our community truly be reached for the cause of Christ!